ARLINGTON, VA; JUNE 22, 2011 – AN AMERICAN FAMILY: ANNIVERSARY EDITION, a 2-hour version of the original 12-hour reality series that changed television history, will air Thursday, July 7, 2011, 8:00-10:00 p.m. ET (check local listings) on PBS. AN AMERICAN FAMILY: ANNIVERSARY EDITION will provide viewers a window into the groundbreaking series, which has not been seen nationwide on PBS for more than 20 years. In the New York area, the documentary will air on Friday, July 8, 2011, 9:30-11:30 p.m. ET on THIRTEEN. Viewers can also watch excerpts from the original series and one full episode at: http://www.pbs.org/programs/american-family/. Filmmakers Alan and Susan Raymond, who worked on the original landmark production, have now adapted the 12-hour series into a new two-hour feature-length compilation of the most memorable and compelling moments of the series. AN AMERICAN FAMILY: ANNIVERSARY EDITION provides a fresh perspective to viewers who may have missed the original series airing nearly 40 years ago. Beginning on Monday, June 27, fans of the PBS Facebook page can watch the full two-hour Anniversary Edition of the film. Additionally, filmmakers Alan and Susan Raymond will discuss the film in a live online chat on Thursday, July 7 at 2 p.m. ET. Originally aired on PBS in 1973, AN AMERICAN FAMILY was the most controversial and talked-about television program of its time. In the course of its three-month run, the 12-part series riveted the country and drew in a record 10 million viewers a week. In the years since it was first broadcast, the series has become the subject of lengthy articles and reviews, including panel discussions with anthropologist Margaret Mead, who speculated that AN AMERICAN FAMILY could be the beginning of a new way to explore the complexities of contemporary reality, “maybe as important for our time as were the invention of drama and the novel for earlier generations,” In 2002, TV Guide named AN AMERICAN FAMILY one of the Top 50 Greatest Television Shows of All Time. 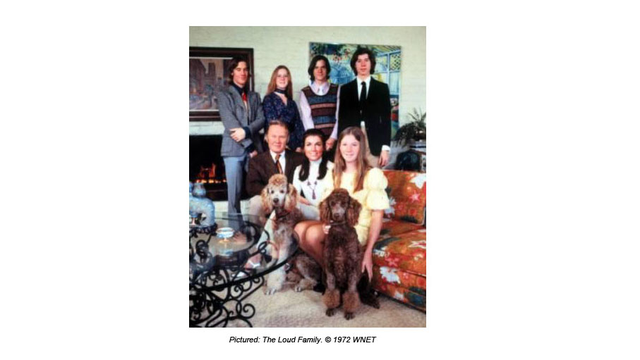 The original 1973 series AN AMERICAN FAMILY stepped into the home of the Loud family of Santa Barbara, California, chronicling the lives of its family members. The series made parents Pat and Bill Loud and their five children Lance, Delilah, Grant, Kevin and Michele Loud household names. During the seven months that the family lived under the microscope of the camera, viewers watched significant life moments unfold including Pat Loud asking for a separation from her husband Bill Loud, as well as a glimpse into the New York lifestyle of their gay son, Lance Loud. Unlike most documentaries of its day, AN AMERICAN FAMILY had no host, no interviews and almost no voice-over narration. Producer Craig Gilbert and filmmakers Alan and Susan Raymond portrayed everyday life without embellishment in the style of cinéma verité. The first episode was broadcast by PBS on Thursday evening, January 11, 1973 at 9:00 p.m. AN AMERICAN FAMILY: ANNIVERSARY EDITION was produced by Alan Raymond and Susan Raymond. Edited by Alan Raymond. Supervising Producer: Charlotte Mangin. Original Series Conceived and Produced by Craig Gilbert. For WNET: Executive In Charge of Production Stephen Segaller. For WLIW: General Manager John Servidio. A WLIW production in association with PBS and WNET.